Many veterans have received their clasp whilst others are getting increasingly frustrated by the long wait. Others have been told they do not qualify. Many stories are in the U.K. press relating to the latter group. :- if you are a RAAF veteran and served on either a RAF Squadron or a RAAF Squadron you apply to the Department of Defence in Canberra. The correct form is attached. AD807 This is for all RAAF veterans. Do not apply to the U.K. They will send it back to you. All the information required is on the forms. The process I have have been told if you served on Australian Squadron that the process is fairly straightforward as the records are in Australia. But you will still have to wait. First of all, there is the wait involved in the processing here in Australia. Then there is the wait for clasps to be dispatched from London. The clasps are only dispatched from the U.K. on receipt of the approved application from the U.K. and can only be issued when to the applicant when they are received here in Australia. There are no supplies of clasps in Australia and the Ministry of Defence has refused to send any unless they are for a specific applicant. The Australian authorities are processing applications for living veterans first, then others in order of receipt. In the U.K. it is living veterans, then widows, then immediate family, then next of kin. I had hoped personally that the relatives of fallen airmen would receive some priority but that is not the case. So after you have submitted your application expect a wait…a long wait. b. Flew at least one operational sortie. Note 1: The above criteria mean that eligible personnel will have already qualified for the 1939-45 Star. (3) were taken as a prisoner of war. 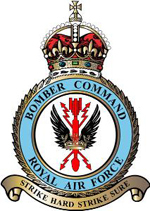 Are direct families able to apply for the Bomber command clasp after the RAF personnel have died? My father was in bomber command during WW2 from 1941 to when he was shot down in 1942 & imprisoned in a PoW camp in Germany for the duration. He flew Wellington bombers. Yes,my Great Uncle died during WW2 and we have got his clasp for him,I am sure even if Aircrew survived the war,but have passed away,they are still eligible for the clasp.All the best,Laurence.